Solar Cinema screening at Pjazza San Ġorġ during the Valletta Green Festival. Solar Cinema, a mobile cinema which is powered entirely by solar energy, is making its way to the Maltese Islands this summer, as part of the Valletta 2018 Cultural Programme. Solar World Cinema is an international network of solar-powered mobile cinemas which pop up in numerous outdoor public spaces across the globe, bringing unseen films to unusual places for the general public to enjoy. Each mobile cinema is completely self-sufficient, powered by 100% solar, sustainable energy thanks to photovoltaic panels which capture enough sunlight during the day to produce 10 hours of film screening. 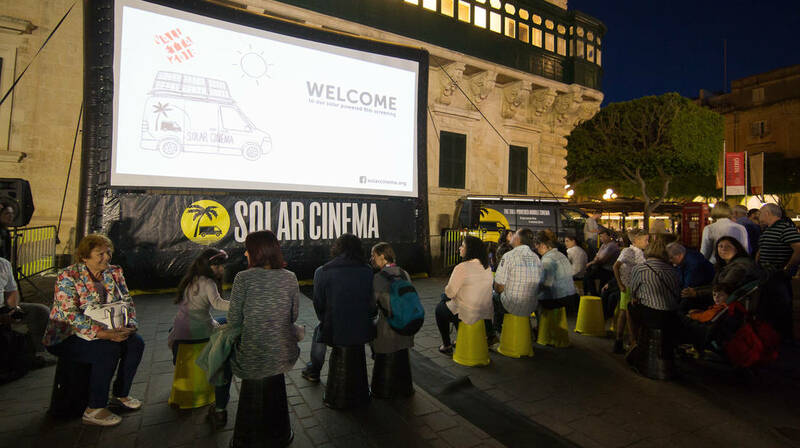 Screenings by Solar Cinema will be held in various public spaces across Malta and Gozo throughout the summer, including in Żurrieq, Żebbuġ, Luqa, Birkirkara, Qrendi, St Paul’s Bay, Sliema, Mellieħa, Marsascala, Ta’ Xbiex, Msida, Rabat, Paola, Mġarr, Kalkara, Lija, Żejtun, St Lucia, and Qala, Xagħra and St Lawrence in Gozo. Visitors are invited to bring a cushion or a chair to enjoy open-air screenings and post-film discussions during the upcoming spring and summer evenings. All screenings are open to the general public free of charge between May and October 2018. Solar Cinema goes beyond the borders of the traditional cinematic world, offering a curated programme of both local and international short films, thought-provoking documentaries, animations and feature films tackling a number of salient social issues, with a focus on themes of sustainability and the environment. Some of the themes include voyages and migration, island life, water and the environment, and human encounters. Solar Cinema’s mission is to democratise the access to cinema, by creating a special platform which allows people to spend time in outdoor public spaces turned into sustainable open-air cinemas. This unique way of engaging with film also raises awareness and stresses the importance of switching to renewable energy sources. In Malta, Solar Cinema has already worked on stop-motion film workshops for children during the Valletta Green Festival, promoting environmental awareness through the use of recycled materials. For more information visit solarcinema.org. For updates on upcoming screenings visit the Solar Cinema Facebook page.